Precision is a central aspect of my work. I strive to create art that is as ordered and as flawless as possible, while at the same time keeping the central focus on its human and aesthetic qualities. The consequences of this exactness not only invite, but also encourage viewer participation in order to fully experience and appreciate the art. I consider myself more of a sculptor than a painter, essentially "sculpting" in two dimensions to achieve three-dimensional effects. 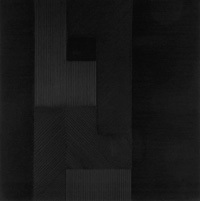 My exclusive use of black paint eliminates distractions caused by color and enhances perceptions of depth. The process begins with the application of multiple layers of paint to birch panels, and then sanding and smoothing those layers to produce flat working surfaces. More layers of paint are then added and sanded on an area-by-area basis, eventually covering the entire surface of the panel. Lastly, wax is applied and rubbed into the composition to complete the process.